Published in The Leader Newspaper, October 2018. 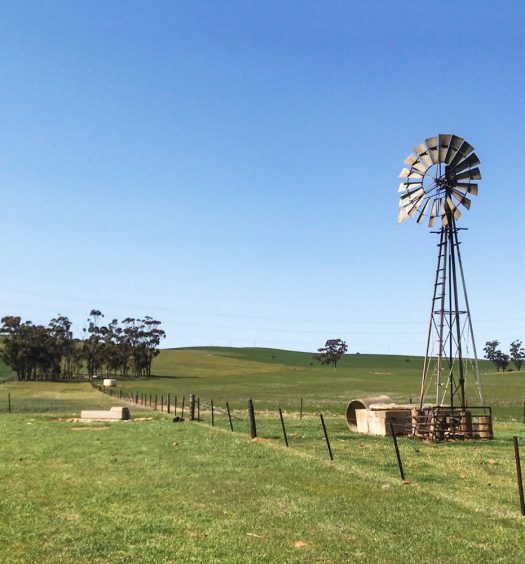 Having grown up in the Barossa Valley, one man’s fascination for South Australia’s Heysen Trail recently led him to complete the 1,200-kilometre adventure. 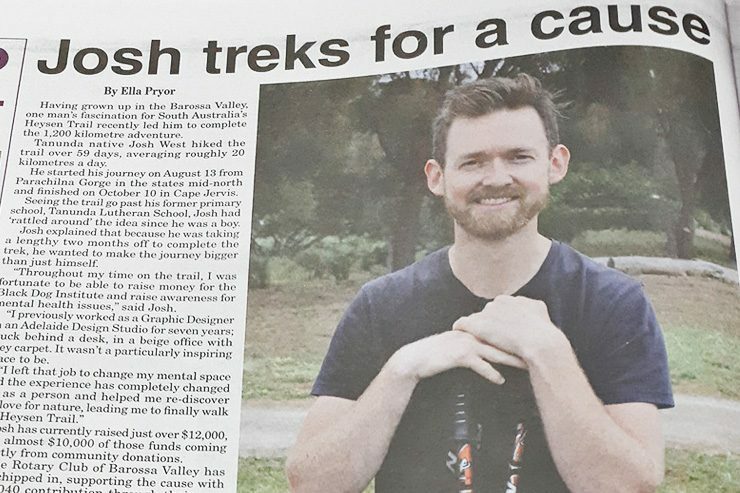 Tanunda native Josh West hiked the trail over 59 days, averaging roughly 20 kilometres a day. He started his journey on August 13 from Parachilna Gorge in the states mid-north and finished on October 10 in Cape Jervis. Seeing the trail go past his former primary school, Tanunda Lutheran School, Josh had ‘rattled around’ the idea since he was a boy. Josh explained that because he was taking a lengthy two months off to complete the trek, he wanted to make the journey bigger than just himself. “Throughout my time on the trail, I was fortunate to be able to raise money for the Black Dog Institute and raise awareness for mental health issues,” said Josh. “I previously worked as a Graphic Designer in an Adelaide Design Studio for seven years; stuck behind a desk, in a beige office with grey carpet. It wasn’t a particularly inspiring place to be. Josh has currently raised just over $12,000, with almost $10,000 of those funds coming directly from community donations. The Barossa Valley Rotary Club has also chipped in, supporting the cause with a $1,040 contribution through their own fundraising efforts. But the whole experience wasn’t smooth sailing for Josh, who experienced multiple physical and mental challenges along the way. The 26-kilometre Day 19, which has since been nicknamed ‘stormageddon’, was full of unrelenting wind, rain, hail and fog. “The conditions barely let up. At the end of the day, I was completely wrecked, and I thought, do I really want to do this?” he said. His roll of toilet paper had papier-mâchéd the bottom of his bag and everything was completely drenched. But he battled on. Josh also badly sprained his ankle with just two and half days remaining. “I had walked through thousands of paddocks and hurdled hundreds of fences, but this one got me. I was walking through a typical field along the beautiful coastline and had just jumped over a stile then I heard a loud crack,” said Josh. However, probably the biggest blow was having his sleeping bag, mattress and hiking poles stolen from his tent whilst staying in the Adelaide Hills on Day 49. Having previously left his belongings in far less secure places along the trail, without hassle, Josh described it as ‘pretty rough’. Luckily, he was able to organise a catch up with a fellow hiker, who he had met on Instagram and had, himself, just completed the trail, to borrow his spare gear. Despite the lows, Josh believes he experienced some of the best moments of his life. There was only one day where he didn’t have any phone reception or communication with the outside world, which he thinks ‘wasn’t too bad’. He laughed as he said for some sections it was just him, his thoughts and his apparently terrible singing voice to keep him company! A massive high for Josh was organising a community walk from the hills of Greenock to the township of Tanunda. 37 walkers accompanied him into the valley, and together, they raised approximately $900 for the Black Dog Institute. But for Josh, his greatest highlights were seeing the trail’s sunsets. “Quite early on, I discovered that I was definitely not a morning hiker, so there were a few days where I finished walking under the stars. I would also often finish a day’s walk at a high altitude, close to 800 metres above sea-level,” said Josh. Because of the late starts, he was able to reach the summits just as the sun was setting and stated those views, in particular, were mind-blowing. 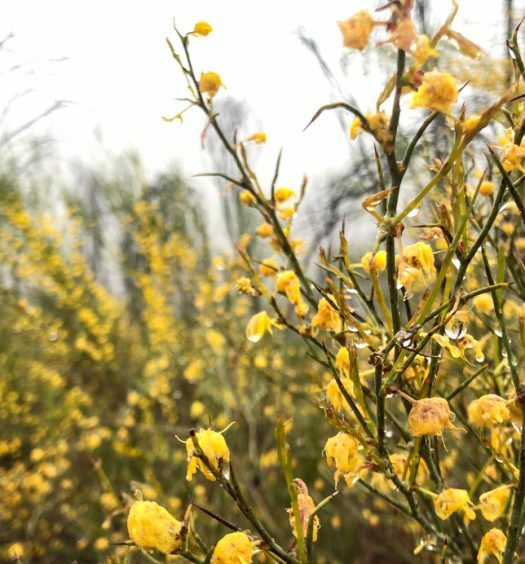 He believes this twilight timing was extremely fortunate, as hikers don’t typically get to experience this glowing scenery and he’ll take away these memories more than anything else. “I also lost about 5 kilogrammes I didn’t know I had to lose,” laughed Josh. “But the biggest thing I took from the experience is the support available from the wider community. I was humbled by the sheer number of encouraging messages and the incredible kindness from everybody throughout the journey. It was an accurate analogy for life. If you are going through an internal battle, do your best to share your situation with others. There are always people able to help.